In South Florida, I have often said, we live closer to wildlife than I did in Philadelphia. That isn't to say we didn't have wildlife in Philadelphia, and I don't mean the two legged variety. I once had a deer in my backyard, roughly a solid mile from the park, but that is another story entirely. Behind my house is an arbor. It's made of some large poles and holds up the bougainvillea and the Spanish Moss that grows there. That is to say there is a massive bougainvillea that forms a privacy curtain along the back window of the Florida room, and you can't get through it because you would be shredded by the thorns that grow on the plant. Bougainvillea are beautiful, but nasty plants. Every time I work with the plant I get stuck by those blasted thorns. Wrap yourself in Kevlar Body Armor and it won't matter. You will get stuck. I suppose that is the attraction of the bloody stuff. Literally bloody, that is. The thorns create a micro-climate safe from things that might "Getcha". Every so often I look out the window and I see things looking back at me. My frog hotel is at the top of the window. Two little boxes, an inch deep, two long, 4 wide. Just big enough for a frog to smack against the glass and hide for the daytime until it is time to go out at night and hunt for insects. I've seen a four foot long green iguana looking back at me with a mouthfull of bougainvillea leaves. I wouldn't mind but those nasty iguanas don't share. I stood up to get a better view and off it ran into the neighbor's yard. This was more benign. 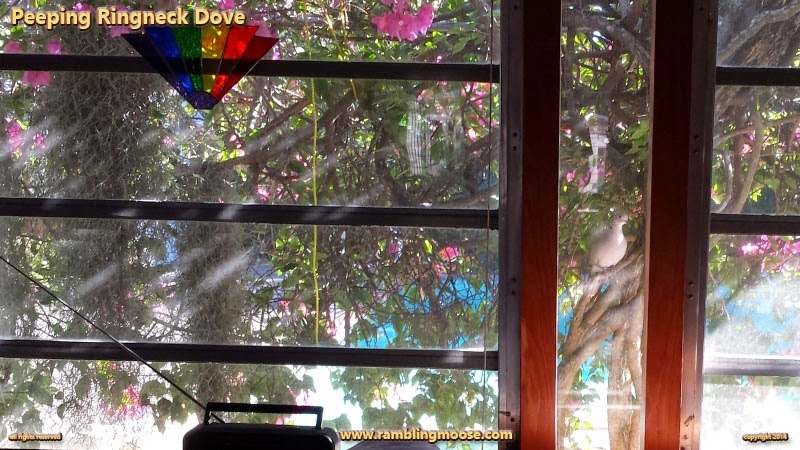 A Rock Dove. Perhaps you call them Ringneck Doves. I go between the names. They're quite common, quite harmless. I simply did not expect to see the thing looking at me and watching me as I go through my normal daily routine. So why not... I got a couple pictures of it. Then it got frightened due to my attention and flew off into the window. They're not bright. Birdbrained might be a better description. They're all over the area here. Might be the teenagers of the avian world with their call of "Meh" whenever you hear them. Harmless creatures, whatever they eat they're welcome to since I know they don't destroy my plants. One of them a while back made a friend in my parrot, Oscar. It would fly over to the cage when I had Oscar in the Florida Room near the window. I would hear Oscar talking to the bird, saying Hello! to it, trying to convince it to talk back, and the Dove true to form would just say "Meh" back. I am guessing that this could be some sort of revisited curiosity, although it might be misdirected. Oscar got moved back into the core of the house to keep him comfortable when the weather changed from warm to cold, or vice versa. I can't really remember which. I don't have that large a house, so he squats in the middle of it making rude noises at us and glowers while that peeping dove tries to get his attention. I should move him back out there, but I'm lazy.